Heat oven to 350°F. In large bowl, mix all ingredients except ketchup and brown sugar. Spread mixture in ungreased 9x5-inch loaf pan, or shape into 9x5-inch loaf in ungreased 13x9-inch pan. 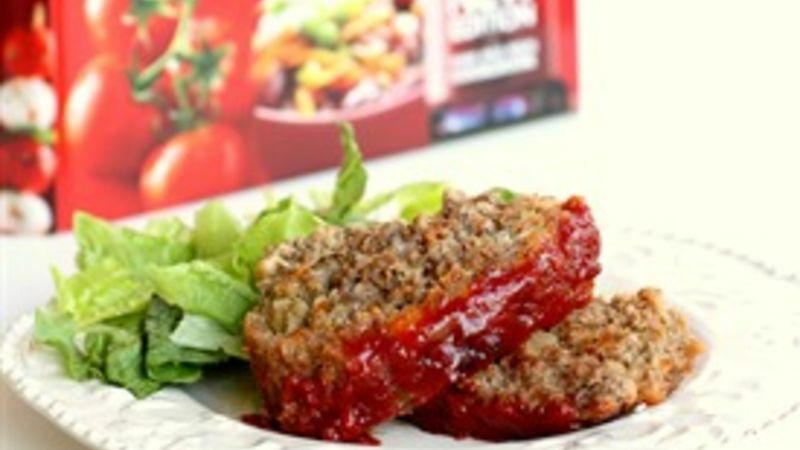 Mix ketchup and brown sugar in a small bowl and then spread mixture over the top of the meatloaf. Insert meat thermometer so tip is in center of loaf. Bake uncovered 1 hour to 1 hour 15 minutes or until thermometer reads at least 160°F. Drain meat loaf. Let stand 5 minutes; remove from pan. There’s a reason that Betty Crocker’s Heirloom Recipe for Meat Loaf is one of their most requested recipes … it’s just that good. While I don’t like mess too much with a classic, I decided to do my own twist on the recipe by adding a little spice and a little sweetness to kick it up a notch. This is definitely not the bland and mushy meatloaf your mama used to make. This Not Your Mama’s Meatloaf recipe will knock your socks off with adobe sauce from canned chipotle peppers for a fabulously spicy and moist meatloaf. Another secret ingredient I add to the meat mixture is crushed saltine crackers. It adds a bit of saltiness and texture. You definitely want to make sure you use lean ground beef so that your meatloaf is not mushy. I love the spicy-sweet combo. I topped off the meatloaf with a brown sugar and ketchup mixture. The smell of the meatloaf cooking in the oven was divine! If you’ve never had a cold meatloaf sandwich the next day, you don’t know what you are missing. Give it a try!